Badarpur is a historical town in South Delhi. The assembly constituency of Badarpur belongs to South Delhi parliamentary constituency. Before the implementation of the recommendations of the delimitation commission of 2008, it was a part of Outer Delhi constituency. Badarpur has always voted for either Ram Singh Netaji, formerly of the Bahujan Samaj Party, or Ramvir Singh Bidhuri, formerly of the Nationalist Congress Party. Later, Netaji joined the Congress and Bidhuri joined the BJP. Bidhuri won the seat in 1993 and 2003. However, in the 2013 Delhi assembly elections Badarpur, for the first time in 20 years, elected a BJP candidate. Bidhuri is the present MLA from the constituency. 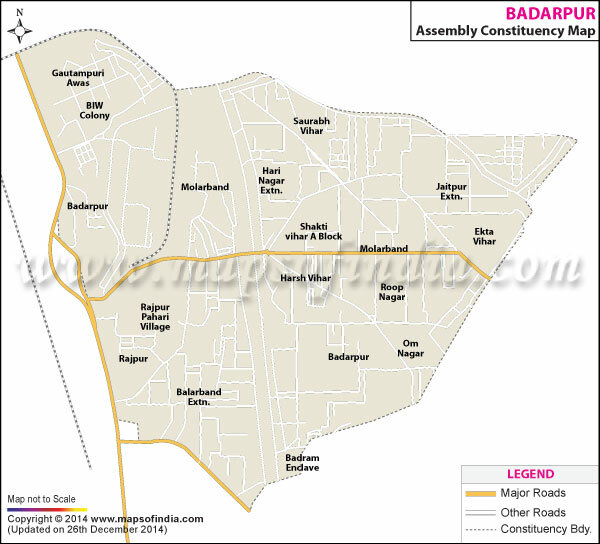 Map showing the different localities of the Badarpur Assembly Constituency. Below is the list of winners and runners-up in the Badarpur assembly elections conducted so far.